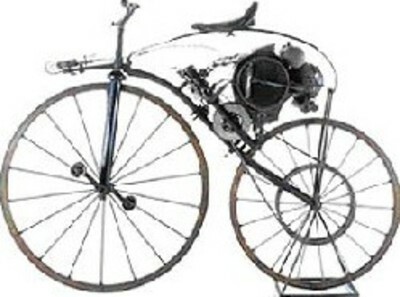 Here is an early motorcycle which is an adaption of a bicycle. The motor is below the frame, and the gas tank is attached to the seat tube. 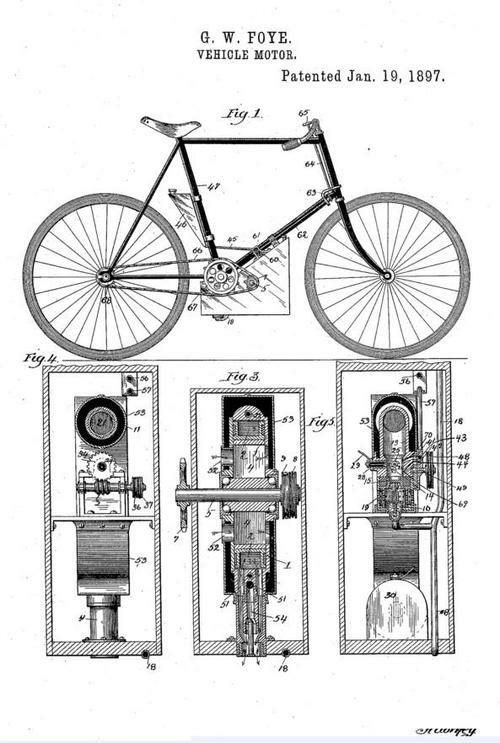 The motor grabs the bicycle chain in front of the chainwheel, and takes over from the bike rider. It appears that the pedals would be furiously spinning as the motor drove the bike, so I don't know what the rider did with his feet. Maybe the motor didn't turn the pedals so fast that the rider could not keep his feet on the pedals. There is a throttle on the handlebar. Alois Wolfmuller patented a two wheeled vehicle in Germany in 1893, and formed a partnership with the brothers Hildebrand. 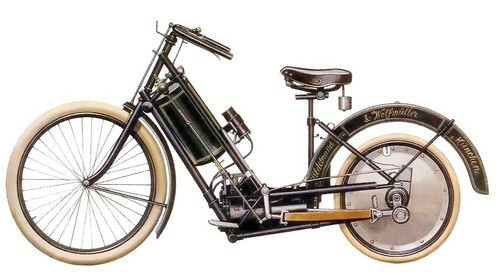 The Hildebrand & Wolfmuller motorcycle was designed from the frame up to be a motorcycle, unlike other motorcycles like Roper's and others that were modified bicycles. The H & W frame was angled and built to house the internal combustion engine. The engine was a two cylinder four stroke engine that drove the rear hub with connecting rods, like a steam locomotive. The engine was 1488 cc, 2.5 hp, and drove the step-through cycle to 25 mph. This beautiful drawing from Motorcycles of the 20th Century. An early gas powered vehicle was designed by Edward Butler of England, in 1885. The design was shown at the 1885 Inventions Exhibition, in London. 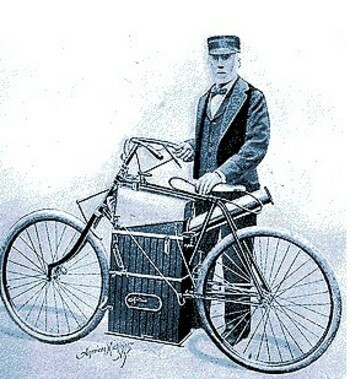 Butler patented the vehicle in 1887, and built the vehicle in 1890. It was a three wheeled vehicle with two wheels in front, and the rear wheel was powered by a chain from the 2 cylinder engine. Any such vehicle in England was doomed to failure because of the highly restrictive 1865 Red Flag Act. This established a speed limit of 2 mph in town, and 4 mph in the country, and a flagman walking in front the vehicle, and two helpers to control horse traffic. The Butler Petrol cycle was a contemporary of the Benz gas powered tricycle and Daimler's vehicle among gas vechicles, and the Serpollet steam vehicle. In the early 1880s Gottleib Daimler worked as an assistant to Dr. Nicholas Otto. Otto was an early maker of gasoline engines, in a time where there was little use for the volatile fraction from oil. Daimler decided to leave Otto and build vehicles using a gas engine. His first vehicle was a test bed for later automobiles, and was basically a motorcycle with training wheels. It was called the Daimler Reitwagen, and was patented in 1885. It had a wooden frame, a seat about like a saddle for a horse, and two outrigger wheels on springs. Daimler's son rode the machine for 6 miles around the roads rural Cannstatt Germany. The machine had twist grip controls, and was air cooled. It had one cylinder, weighed 198 lbs (90 kg), and a top speed of 7mph (12km/hr). The engine was fan cooled, put out 0.5 hp, and ran at 700 rpm. The wheels were wooden with an iron band on the outside. 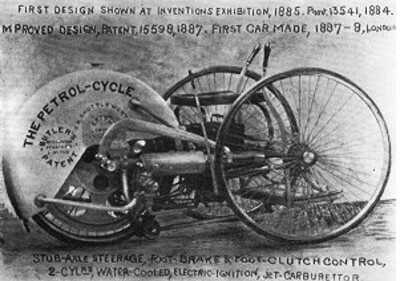 Considered by some the first motorcycle, it actually had 4 wheels so was not a motorcycle, and came 16 years after the steam powered motorcycle of Sylvester Roper, and 14 years after the Michaux - Perreaux steam powered bicycle. At the same time as Daimler was developing his "motorcycle", his future partner Carl Benz was designing a motorized tricycle. 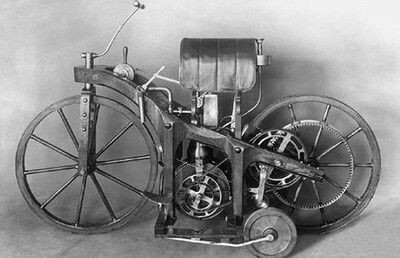 Although not the first motorcycle, an early motorcycle was that designed by Felix Millet of France in 1892. Millet had patented his first motorcycle in 1888, and had several improved versions. It incorporated a radial engine around the hub of the rear wheel, with the five cylinders rotating around the hub. It had foot pedals connected to the rear wheel by a chain, and twist grip throttle control. With its massive .7 hp, is could achieve a speed of 22 mph, which was pretty fast considering braking was by use of the foot pedals. This radial engine was similar to later radial aircraft engines in which the cylinders rotated around the center crankshaft. 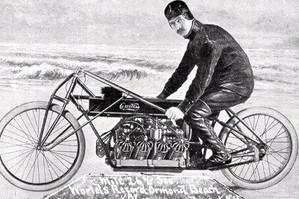 The Millet motorcycle was 20 years later than the Roper steam motorcycle. 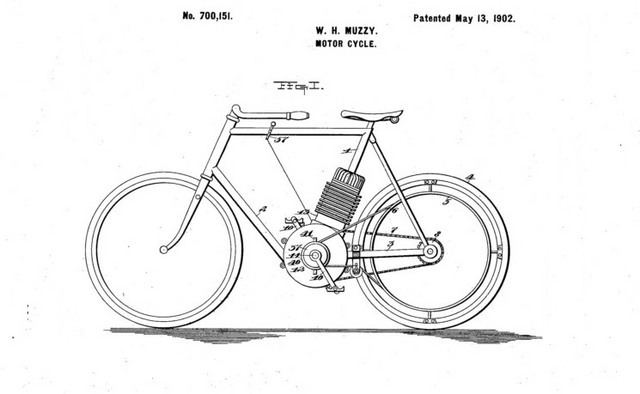 W. H. Muzzy invented a motorized bicycle in 1902, which was in the form of the early motorcycles. It was driven by a belt that ran from the motor to a sheave on the rear wheel that was almost as large as the rear wheel itself. Early motorcycle belts were leather. This version had the bicycle pedals, which probably was used as to start the motor. 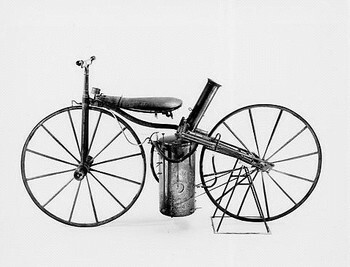 The first motorcycle was a steam powered oddity built by Sylvester Roper in 1869. It was a steam powered bicycle or motorcycle. 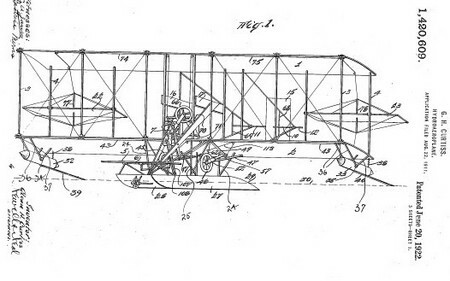 It went through several revisions, and by 1896 it could do 40 mph, and ran 7 miles on one load of coal. 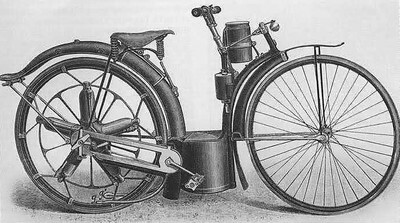 The small boiler was mounted between the riders legs on a bicycle-like frame. It had two cylinders, and a smokestack. Twist grips on the handlebars served as throttle and brake. The inventor liked to say, "It would climb any hill and outrun any horse." Roper died like we all should, at the age of 73 riding the third version of his crazy contraption around a track at 40 mph. He died in the saddle, and was dead before his bike hit the ground. Shown is his earliest version, and the last version. The first float plant was patented in 1922 by Glenn Curtiss. It was designed to take off from and land in water. Besides being an inventor, a pioneer aviator, Curtiss was also a motorcycle racer. A lot of motorcycles would be nominated for that list, but one that every enthusiast would put in the top 5 would be the Vincent Black Lightning. What is amazing is that this revolutionary bike was made in 1948, and was the fastest production bike well into the 1970s, 20 plus years after the company ceased production. Vincent motorcycles started when a young Phillip Vincent acquired the rights to the trademark of the well respected British HRD motorcycle in 1928. With the help of engineer Phil Irving, Vincents got better and better. Besides adding power, the Vincent machines pioneered features that were innovations to motorcycle technology. This included the first full rear suspension, a foot shift 4 speed gearbox, V Twin engine, and side stands. The Vincent Black Shadow of 1948 pushed the envelope further, with a cruising speed of 100 mph, and a maximum speed of 125, despite the speedometer’s 150 mph top peg. 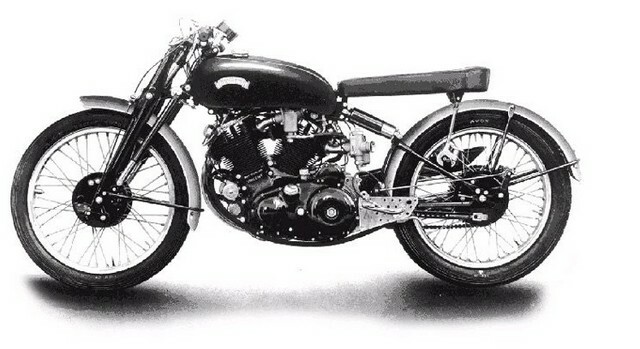 The Vincent Black Lightning also came out in 1948, and was a sensation in the motorcycle world. It had a top speed of 150 mph, and was rated at 70 horse power. On September 13 of 1948, Rollie Free became the worlds fastest motorcyclist at a speed of 150.313, riding a specially tuned production model Vincent Black Lightning on the Bonneville Salt Flats in Utah. The previous record was 136.183 mph, set by a Harley Davidson. Free’s riding leathers had torn in earlier runs of 147 mph, and they were scooping air and flapping, so for the record breaking run, he wore a speedo and sneakers, and extended his legs back to reduce drag. Vincent Black Lightnings went on to win races and set records all over the motorcycle world. Unfortunately, the company went out of business in 1955. Never forgotton, Black Lightnings are much sought after. A Black Lightning is dangled by Bruce Wayne (George Clooney) in the movie "Batman and Robin", to entice the juvenile deliquent Robin (Chris O'Donnell) to stay on at the Wayne mansion. Recently, bluegrass song of the year "Vincent '52" by Richard Thompson, Rumor and Sigh CD, was centered on a highwayman, his girlfriend, and his 1952 Vincent Black Lightning.